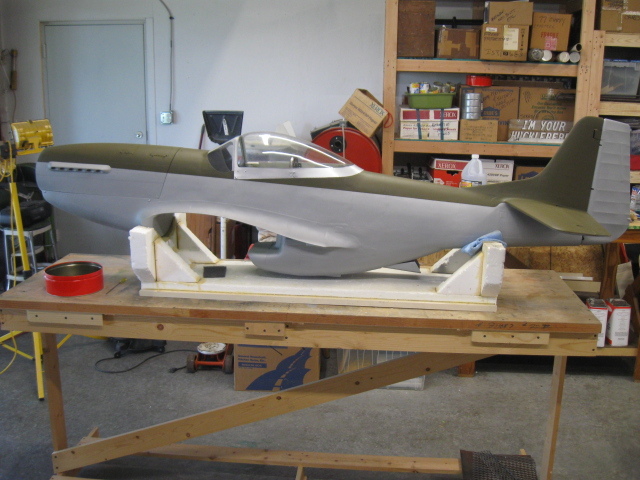 When you begin a major warbird build, you really need to give it your complete effort. Not only in the build, but finishing out as well. And the most satisfying finish is to paint her depicting the prototype bird as closely as you can. 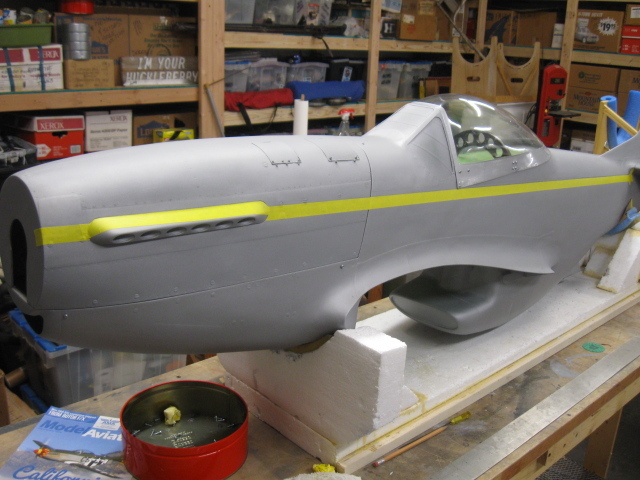 With the great amount of time I had invested in the construction the CARF P-51D, I felt I couldn’t skimp on the paint just to get the job done and move on to the next project. Just didn’t add up to go cheap! And by cheap, not really talking dollars and cents, but in appearance. I had never fully painted a warbird with all the markings but used vinyl “decals” instead. Now, this does save time and effort, but they don’t quite look the same as painted-ons and they may bubble-up under the sun later on. So, I decided to go the “full Monty” and paint the markings over the basic paint job and give it a go. I am not an artist so I had to have some help along the way. Paint masks are the way to go if you are like me. 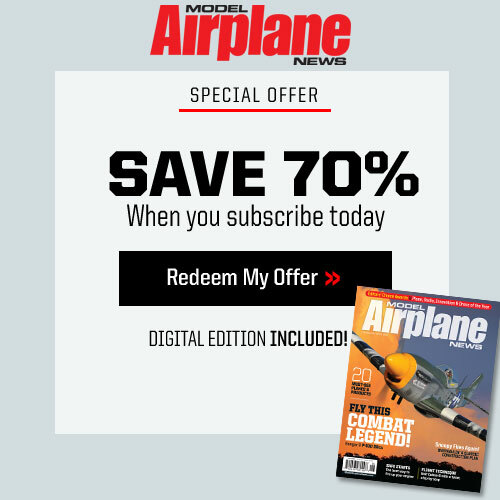 Callie Graphics in NM offers paint masks for dozens, maybe hundreds of warbirds which are scaled to meet the size of the model you are building. The masks include the difficult items like nose art and personalized aircraft names which would require an artist’s hand to create. 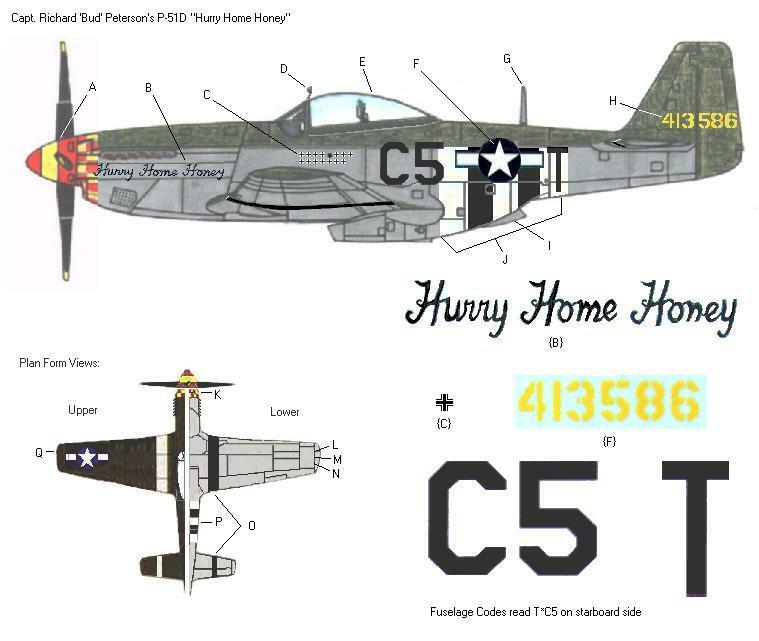 My choice of paint scheme for the P-51D was Hurry Home Honey, and Callie was able to furnish a two-part paint mask which duplicated the personalized HHH script perfectly. I will discuss how this works later in the article. 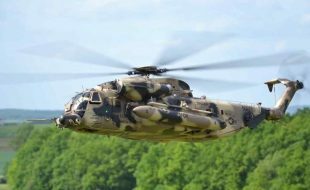 The basic paint job requires several steps the same as just about anything you are painting – surface preparation and priming, color(s) painting, squadron markings, and personalized markings. I chose HHH because she had it all: silver lower fuselage and bottom wing, olive drab upper wing and upper fuselage, Invasion stripes, stars and bars, white wing and tail flashes, victory marks, yellow rudder, checkerboard nose, and matching spinner stripes, and of course, a catchy personalized name on the nose; Hurry Home Honey in yellow and red. I really couldn’t ask for more in a paint scheme. But, with all those colors and markings, there was a lot of work in completing this paint scheme. The entire job took 2 months of working (almost) every day to complete. But, considering I spent 3 years, off and on, to complete the model, not really out of line with the overall effort. 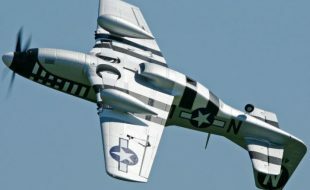 There are actually two versions of HHH; the WW II version and the current immaculately restored version you can see at many airshows in the summer months across the USA. This model is really a cross between the two versions. I began by studying the current version but after getting to the final phases of construction, I favored giving it the WW II appearance by configuring the cockpit to show the full military outlay of seat armor, radio, battery, gunsight and a few other details the current airshow version had deleted to make it a two-place, modern cockpit. One thing that (possibly) changed somewhere along the line between WWII and now is that the rudder went from OD to bright yellow. The pilot is known to have flown multiple P-51s in this livery, so, perhaps one of them had the yellow rudder. I think the case could be made for either. First a shot of the completed bird to get you in the proper frame of reference. 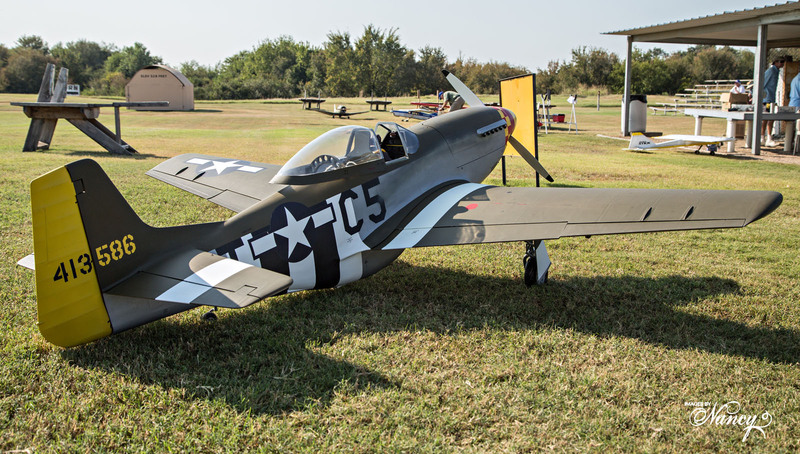 Small note on the history of this P-51D. 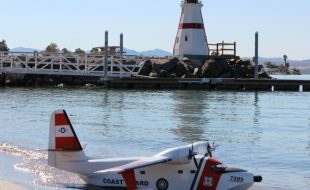 Flown by Capt “Bud” Peterson. Personalized name on the nose was chosen because his sweetheart and later his wife, ended her letters to Bud with “Hurry Home, Honey.” All markings except the small nomenclatures were spray painted. Nomenclatures are dry rub-ons and are available from several vendors in various scales. I wasn’t able to find any paint masks for these items. Lead photo and this one by Nancy Abby. The rest of the photos are my own. I was able to find a good shot of the scuffed surfaces before priming. After the scuffing, I wiped the model down with some oil and grease remover to ensure a clean surface. I used #190 cleaner from English Color that works very well and will also clean your model of spent oil on the fuselage after flights. Next you need to find a suitable primer with some quick drying attributes as you don’t want to wait 24 hours to dry before sanding. I used English Color #301 high-build grey primer – it’s dry before you set the gun down. 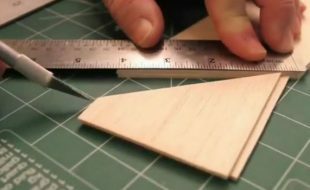 Layout your pieces and give them a good coat of primer. You can sand it down later of course, but don’t over-do it on the first coat. Be sure not to put so much on that you lose surface details like rivets and panel lines. Give the primer a sanding with the 3M pad is the best bet as it tends to not wear thru the high areas as much as sandpaper. Wet sanding is not really required either. All my work was sanded dry, with the exception of the spinner and checkerboards. 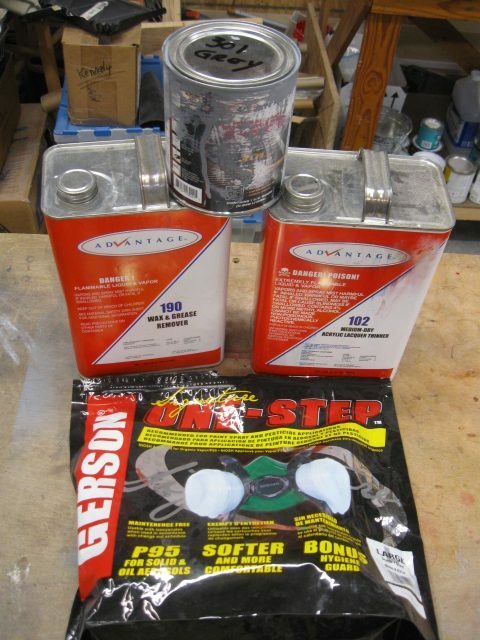 High build #301 Grey Primer, Medium Dry Acrylic Lacquer Thinner #102 (for primer), Wax & Grease Remover #190, and paint respirator. 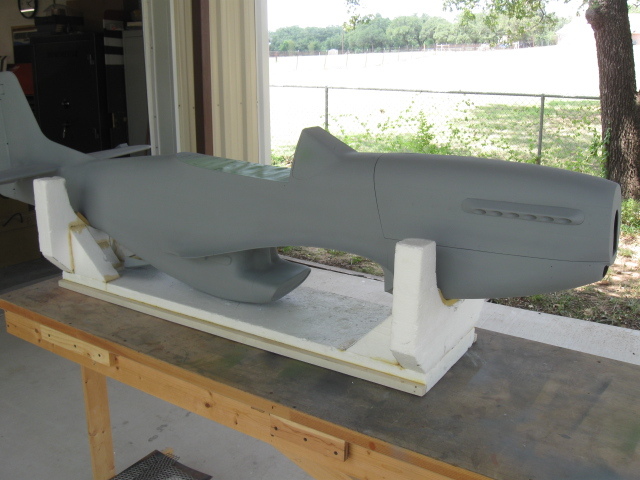 Fuselage primed. Be sure to mask off any openings into the interior. I left many interior components installed as completely stripping it down wasn’t required as long as the fuselage was properly masked off. As long as I am about to talk finish colors, I will add that I mostly used Behr Flat Latex Exterior House Paint with the exception of the silver color. Latex house paint cannot be tinted to look even remotely like silver or aluminum. So, I went to English Color Paint Store to find some automotive paint to do the job. Any automotive paint dealer can custom mix a color for you at no additional cost including adding flattener to the paint. Most automotive paints can be very dangerous to breathe so be sure to by a rated paint mask that fits your face tightly. I found one that was under $20 and was good for 40 hours use – cheap health insurance. Keep the mask sealed in the package it comes in and jot down the total time used for each session. When you go to Home Depot or Lowe’s for house paint, be sure to take a WW II Mil Spec paint chip sheet for the computer matching. M&M Models offered one a couple of years ago, and I was lucky enough to get one before they sold out. There are certainly other sources for color chips, but I don’t have any sources to list. I wouldn’t recommend trying to use these photos for color chips at the paint stores; I doubt they would provide any usable results. 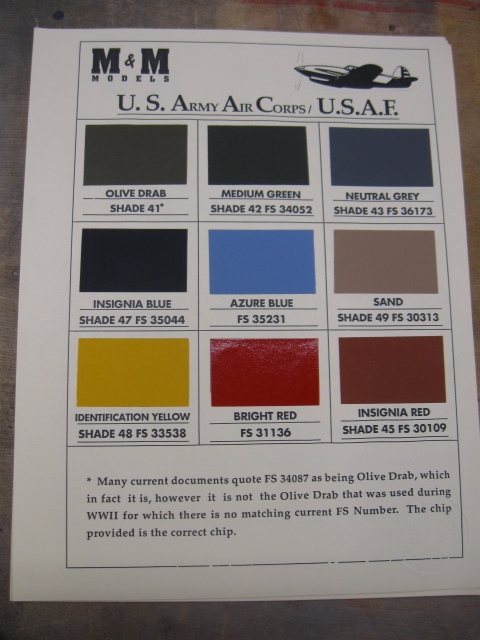 Here is where I get the original Olive Drab Shade 41 color. 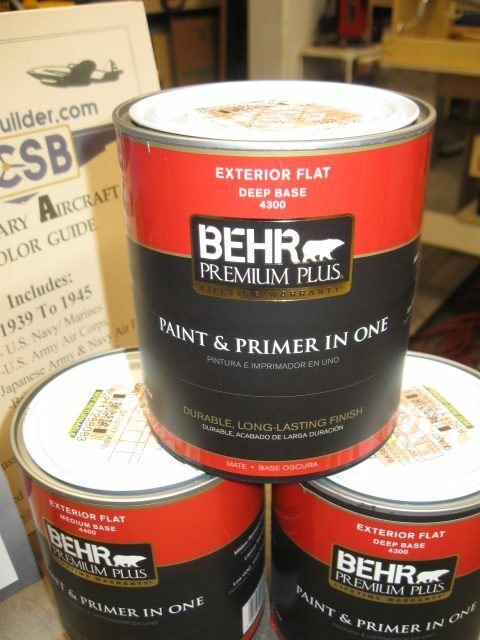 Behr latex exterior house paint. 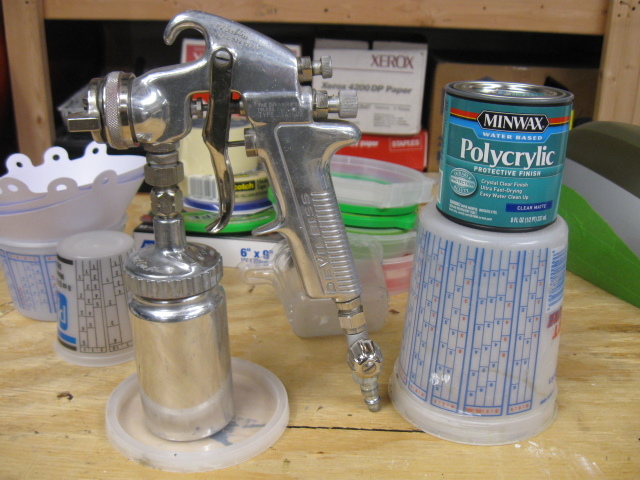 This is the Devilbiss JGA paint gun used for the paint project. Had it for 30-plus years, works fine for primer and paint. Polycrylic clear coat used after paint had dried – evens out the colors and gives a nice low sheen. 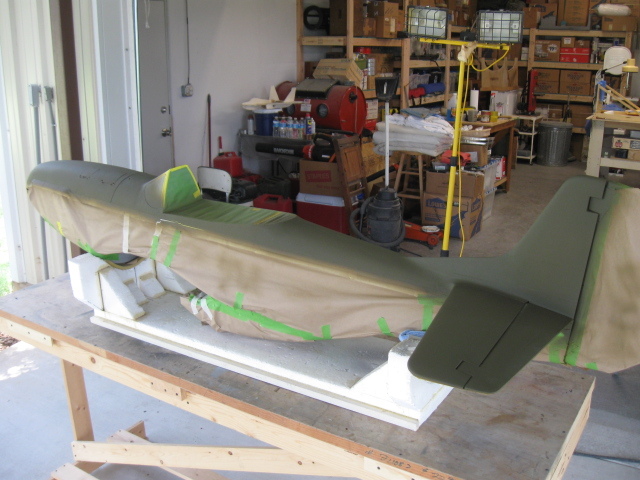 Once you have things primed, you can move to your first color, in my case, the silver fuselage and wing and tail bottoms. I decided to paint the entire fuselage silver despite that only the lower half would end up silver. I needed some weight on the tail end anyway since I had performed a pre-painting CG test that showed her to be very nose heavy. 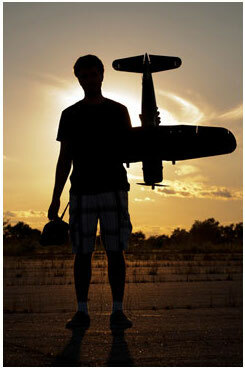 That doesn’t happen often – warbirds are usually tail heavy. 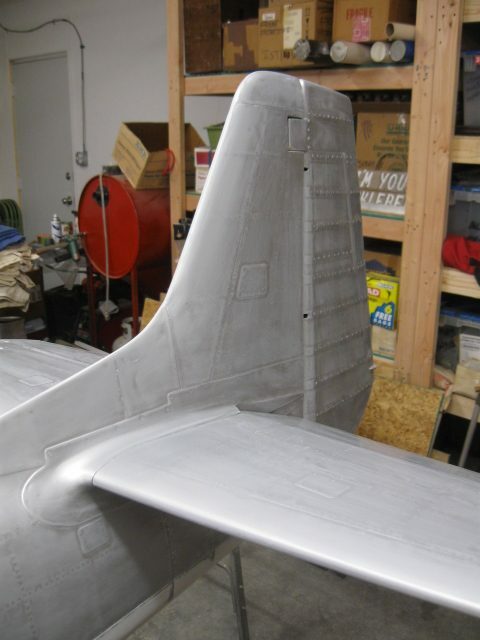 Fuselage after the silver paint applied. Note masked off areas, especially the windscreen and wing attach cradle. Interior of the cockpit and other areas must be protected from any overspray top and bottom. 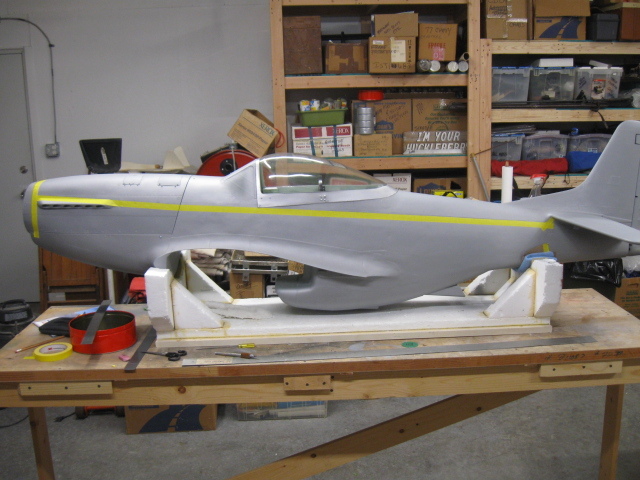 Now comes the part of the paint job that you must take your time with – adding the upper color on top of the lower. In this case, it’s the Olive Drab Shade 41 over the simulated aluminum silver. First attempt at laying out the upper color masking. I had a problem on the nose around the exhaust headers. The prototype shows the paint line above the header manifold. Didn’t look right as I had to make a slight angle-up at the cowl. No matter what the full-scale bird shows, sometimes you have to wing it. See the next photo. In the interest of appearance, I fudged on the line to make it straight from aft to forward. More pleasing to the eye. The problem started with the edge of the canopy frame. I had to lower the line a touch to avoid having the bottom edge of the frame painted silver. 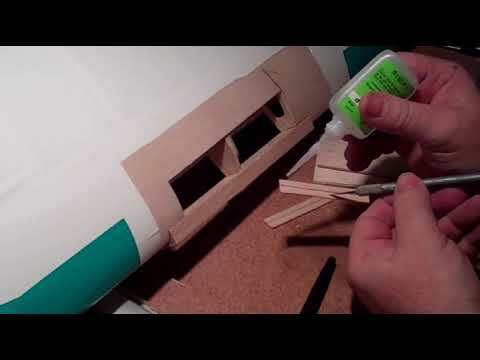 After adding masking paper over the lower fuselage and rudder, the OD shade 41 was sprayed. Several light coats were required as the latex needs to be thinned out to spray properly. I use windshield washer fluid and Floetrol in the paint to make it a breeze to spray. Let each coat dry before adding the next. I used a heat gun to speed things up. But be careful on the composite material, it can be damaged with too much direct heat. I am glad I modified the paint line on the nose. Very pleasing appearance. 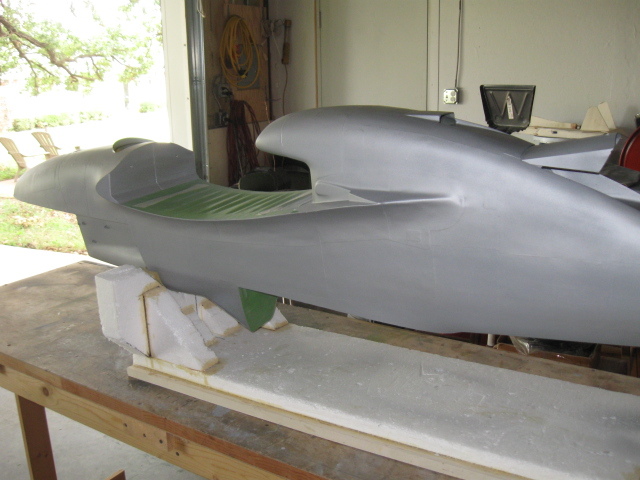 Next week, we’ll mask and paint the canopy — the one thing you can’t afford to mess up! Nice job so far! 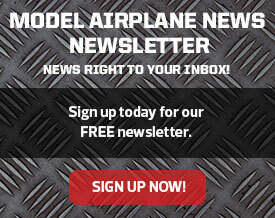 Can you tell us who makes the model an the engine you are running? 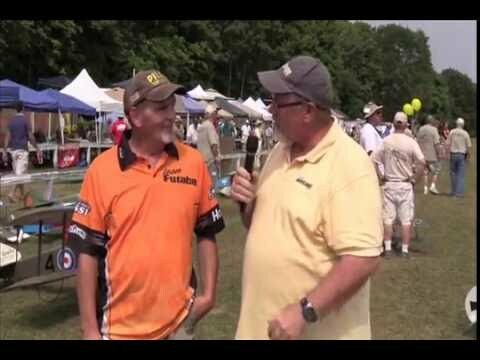 Lane – thank you for the great description of what you did. The surface detail on the tail looks great and would like to know how you did the raised panel and the indented panel lines and how you kept these crisp with the primer over spray. One tip around tough areas like the exhaust stacks, I first use a thin 1/8 or 1/16 flexible tape around these first and then mask the rest of the parting line with the wider tape, overlapping the thin tape border already applied. This seems to be a lot easier for me. 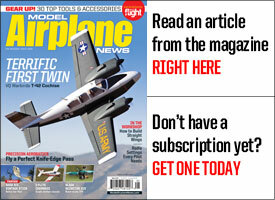 thanks Lane for the article, I am building a kit I have had for many years. Got it at a swap meet for $200. It is a Ralph Saxton 100″ w.s. 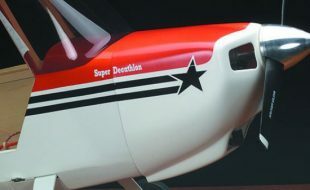 p51d. 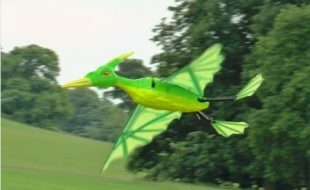 Fiberglass fuse with foam core wings and stabs. I have 85 degree Robart retracts. I chose to laminate the wing foam cores with carbon fiber cloth then balsa sheet then .75oz fiberglass cloth with finishing resin. Interested in your response regarding joining the two wing halves. it appears that Ralph designed in the proper washout, as well as dihedral, so I should be able to line them up and stick them together. use aircraft ply front and rear caps to join them then 2oz cloth out past the landing gear. anything I am missing? Hi Tom, guess I missed answering your questions. 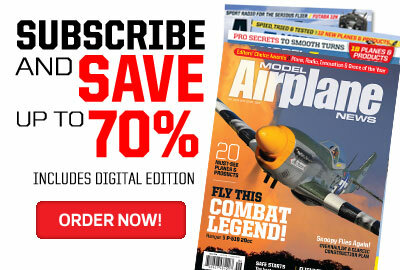 Plane is a CARF P-51D. Engine is the MVVS 80cc gasser. Evolution engines marketed it under their name thru Horizon hobby, but dropped if for some reason. I can only assume it wasn’t a fast seller as it runs well. They replaced it with the MVVS 60cc also under the Evolution name. I ordered it thru Chief Aircraft and it came from the Czech Republic on special order. Parts are hard to get, but it runs nicely. I would replace it with a Desert Aircraft 85cc if I had to but only for ease of spare parts and repairs.